For Halloween this year, Audrey is going to be Dorothy. She’s actually wearing the same costume that my mom made for me when I was a little girl! Precious right?! As I was searching the Halloween store for some ruby slippers to go with her costume, I came across this little Toto in a basket. Because I am so cheap crafty, I decided to make my own. Fabric of choice? Felt of course! 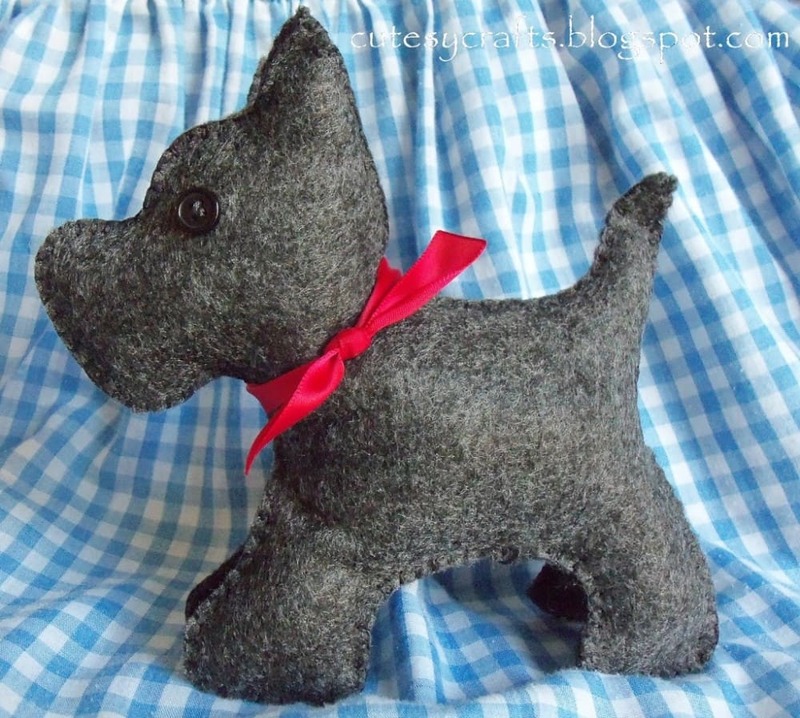 I found an adorable pattern for a little Scotty dog here at allsorts. I enlarged it a bit and changed the face and legs since apparently Toto is a Cairn Terrier (a little bit of trivia for the day). …and a red ribbon to match the ones that will be in Audrey’s hair. He’s hand stitched using a blanket stitch and some embroidery floss. Super cute right?! Now your little Dorothy has no excuse for being without a Toto! 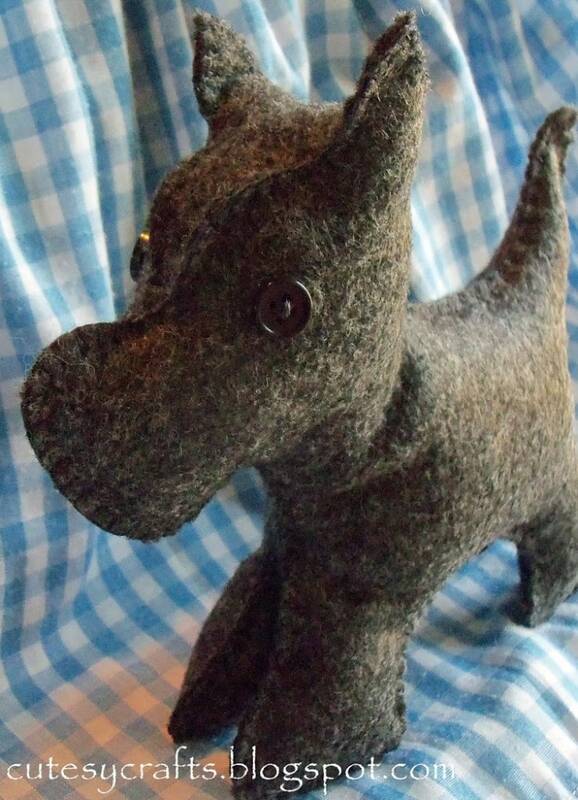 I didn’t make it the same size as a real dog, but definitely bigger than the original pattern. Send me an email and I can try to send you the file that I enlarged. 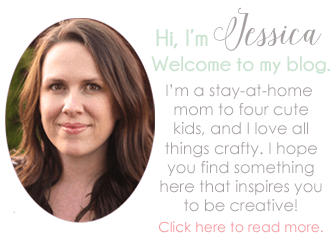 cutesycrafts at hotmail dot com. I would love to have a copy of your revised file too if you still have it. I sent an email to the address you listed above. Thanks!! Hi Dayana. I used the pattern that I provided a link to above, made it a little bigger and altered the face and legs. If you would like me to send you the changes that I made to the face, send me an email. I would love to get your updated pattern. My niece would love this! Send me an email at cutesycrafts (at) hotmail (dot) com and I can email the head that I drew. Please email me the pattern. Thank you! Hi, I would love to have your updated copy also . This is so cute! thank you. This is super adorable! I would like to have an updated copy of the pattern. Hi. Is it still possible to receive an updated pattern. It’s too cute! Thank you.